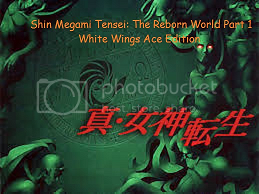 Note that Shin Megami Tensei is owned by ATLUS. 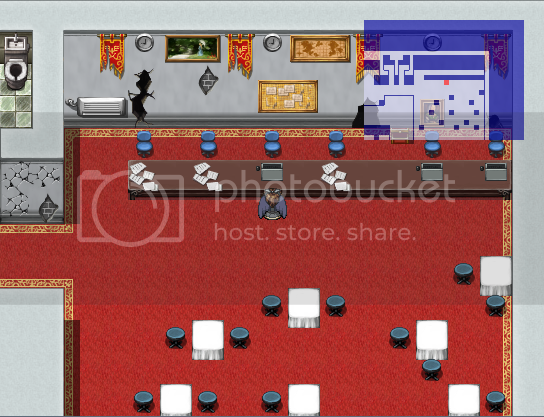 I Take No Credit or Profit for ATLUS owned materials used in this FANGAME. 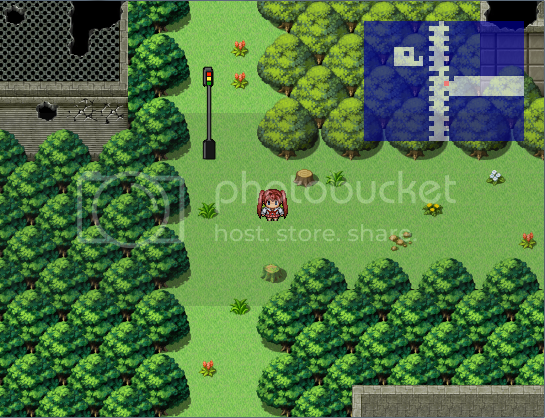 This is an enhanced version of a game I made under the original vx, remade in ace. 1. 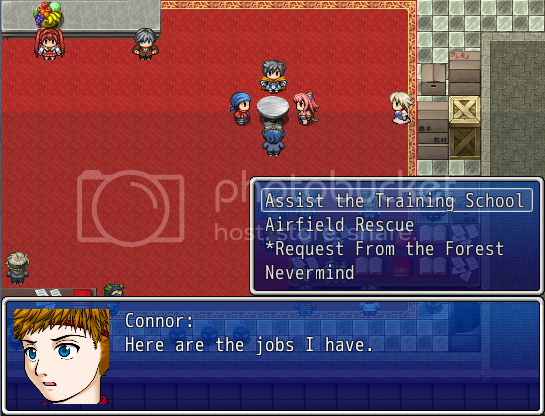 A new side story added with demon recruitment. 2. 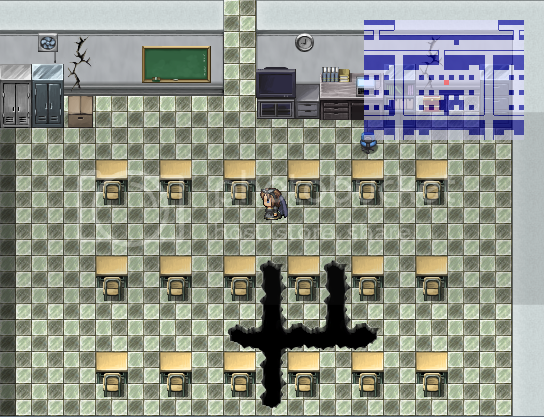 Alignment system and 2 alternate endings added. Original extended. Various dialogue changes. 3. Most maps have more detail. More non RTP content used. 4. Optional limited save mode for classic feel. 5. Balance tweaks to make the game a little more challenging. 6. New sound effects added. 7. Phys skills are now have weapon based affinity. 8. Karn spells now work as intended(reflect). Tetraja(insta death null) added. 9. 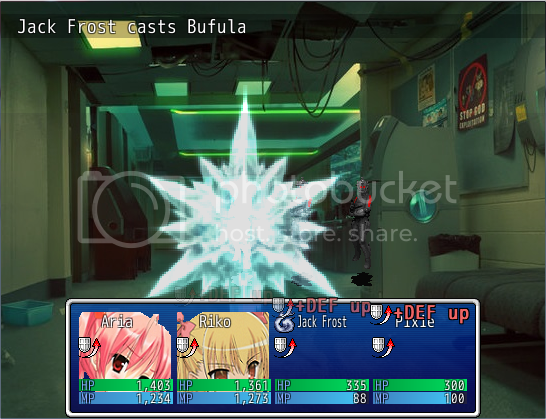 Different HUD and battle interface used. 10. Various left over bug fixes and text errors fixed. and death, mankind has somehow managed to survive. was not well. The demons were still a threat to humanity. 7 Years ago, the hero was killed while fighting the demons. busy with this, the Soviets captured the smaller islands. just one month Japan was conquered by the Federation. them. These were called hunter clans. to begin searching for this artifact. 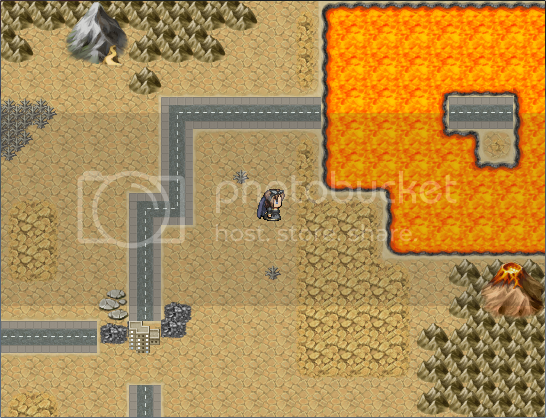 the game will take place between the original smt and stmt 2, and will take place in the wastelands of Okinawa. Knowledge of these games is not required. The story will fallow a group of freelance Hunters, who merge with a dysfunctional hunter clan. 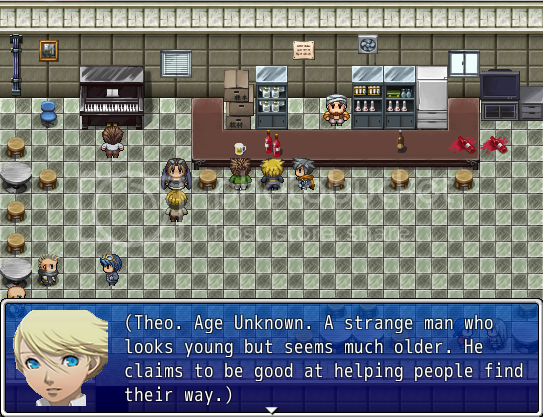 The new side story will feature the ability to recruit demons, and add them to the party. 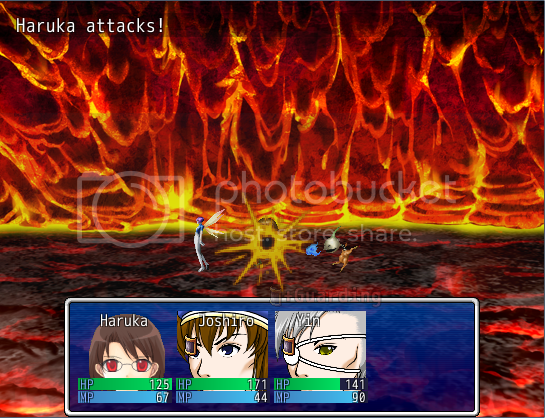 Both stories will feature fights between demons and other survivors. 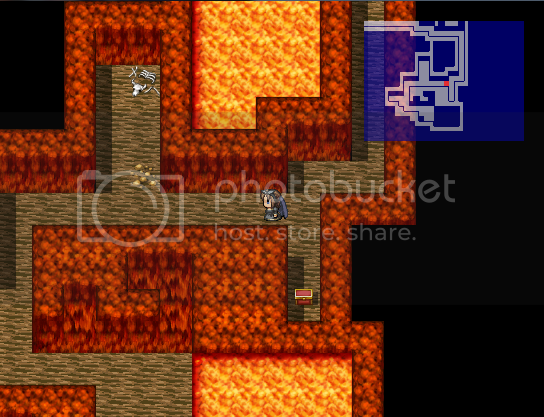 Dungeons will take place in both natural formations, such as caves, and ruined buildings and other man made structures. Around 20 hours. The new side story is about 4-6. A former member of the Black Cat clan. She left along with Joshiro and Yin after an internal dispute. Haruka is skilled with curative magic and has considerable experience for her age. 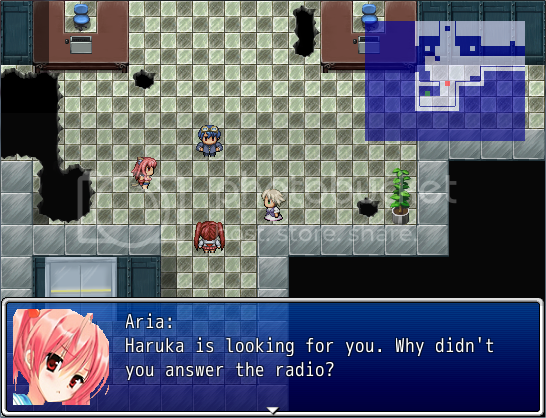 Haruka is a bit of a wild card, sometimes thoughtful and understanding, and at others belligerent and hot headed. Currently working freelance while trying to find what she really wants. Working on the mainland as a freelancer proved to be a very tough competition, so she set off to Okinawa to find work. After a chance meeting with lord Takuya who offered her a job she could not refuse, she unkowingly set out for her toughest job yet. A former member of the Black Cat clan. 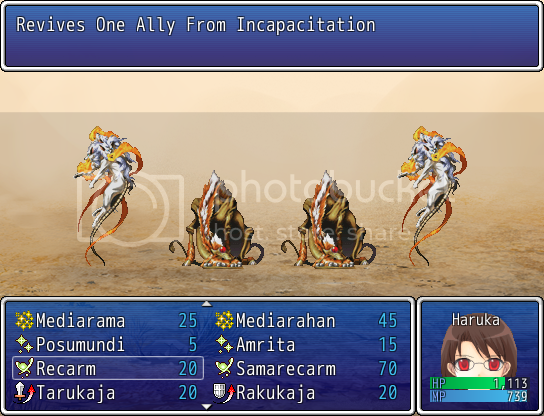 He left along with Haruka and Yin after an internal dispute. Joshiro Is the heavy armor of the team and attacks with close range weapons. Hot headed, he tends to act with out thinking. Joshiro has been working with Yin for several years now and with Haruka for about a year. Currently he is working freelance. Joshiro was starting to get bored from the dull jobs they were receiving as freelancers but meeting lord Takuya has sparked his interest in the rumors floating around about the artifact the Federation is trying to find. Joshiro is one of the few who believes the rumors of the godly artifact. A former member of the Black Cat clan. He left along with Haruka and Joshiro after an internal dispute. Yin is a Gunman who prefers to use assault weapons like shotguns and machine guns. Unlike Haruka and Joshiro, He is bitter about leaving the Black Cats but keeps his feelings bottled up. Currently working freelance while looking for other opportunities. Yin has taken an interest in the Federation and once considered joining them. Yin is suspicious of lord Takuya and doubtful about the job he has been given. The only reason he even accepted was because he badly needed the money. Origin: Unknown, believed to be European or American. A member of the Red Earth clan. Sunanomi is a skilled marksman capable of using both normal ammunition and elemental charged rounds. He was found injured by Kio and Lelu and was recruited shortly after. He has no memories prior to being found. Dasu starting calling him Sunanomi for no reason and the name just stuck. Sunanomi rarely trusts others and most people outside of Red Earth see him as cold and unfriendly but he is fiercely protective of the few he does trust. 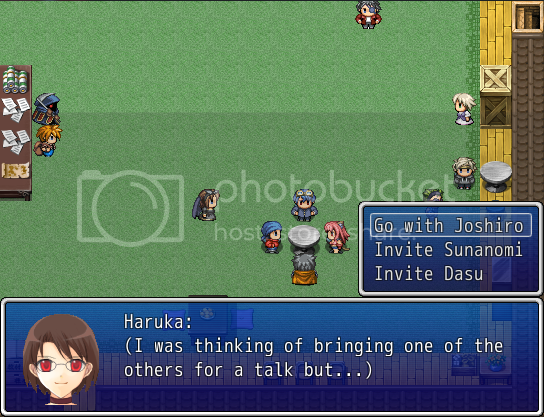 Completely shocking Dasu and Connor, he decided to trust Haruka shortly after meting her during the island expedition and is in favor of joining forces with her team. A member of the Red Earth clan. Dasu is Red Earth's offensive mage. Like Sunanomi he is often seen as unsocialible and cold. Selfish and arrogant, he tends to drive people away and as a result doesn't have many friends. The only people he answers to are Kio and Lelu. While his ego is extreme, it is not with out merit as he has won several competitions and awards in the arena with his magic. Dasu also has a problem controlling himself around women. If he isn't fruitlessly hitting on girls, he generally trains his demonic magic in his free time when he isn't bickering with Sunanomi or Connor. Leader of the Red Earth clan. A former follower of the Gaian faith, he later gave it up after meeting Lelu and has been a working soldier ever since. While he tends to be fair, he does get tired of Dasu picking fights all the time. Second in command of the Red Earth clan. A former Messian, she gave up her position after meeting Kio in a skirmish between the two factions. Fast and nimble, Lelu is the scout of the group and has saved them from ambushes on several occasions. Authority who abuse their power. A member of the Red Earth clan. Xia is the groups doctor. She came from china to find work as a doctor and to get away from the chaos in China after the New Soviet Union took over. She joined Red Earth as a means to get her foot in the door. She is the only person Dasu doesn't fight with apart from Kio and Lelu. 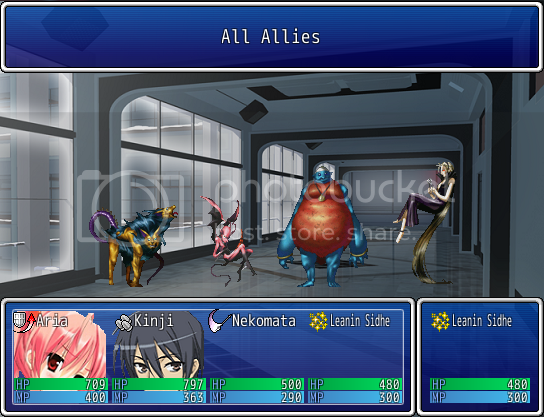 Yanfly Ace Battle Engine & party system. Word Wrapping Message Boxes by KilloZapit. 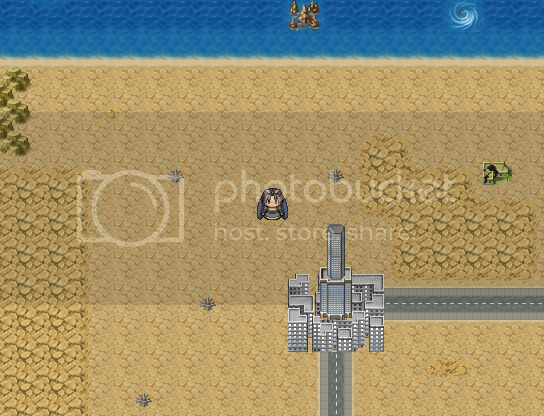 CharCreator, FaceMaker, Famitsu Char generator. Kuzunoha faces take from the anime's they were based on. I haven't played this, but judging from the screenshots there is a huge disparity in graphics. This can't be helped so much with demons in battle (unless you were to remake them all yourself but that's a huge undertaking, so somewhat understandable) but the face portraits are largely inconsistent and it's strange that you'd use Teddie's graphic and call him Theo. Especially when he's a character IN the Shin Megami Tensei series, or at least associated heavily with it depending on your view of the Persona series. As a fan of the series I'll probably give this a look and maybe more in-depth thoughts on the game but for now the graphical inconsistency is something you should keep in mind. and between that and the dialogue with him, was to suggest that it might be the same teddie from p4. He isn't human after all. I tried to be a bit vague but that's not really something I do well. More of the "mainline" SMT games tend to have demons that the Persona games may not include, but here's a pack of every demon (at least I believe so) from Persona 3. It may or may not be useful to you but just in case I thought I'd show you. I think I'll try out your game later today. 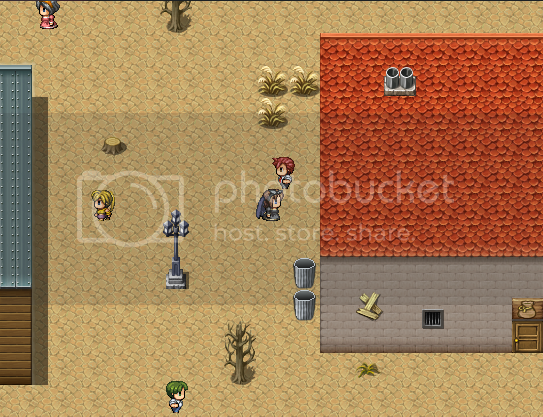 Same site I got the Devil summoner and soul hacker sprites from. Not sure how I missed it, but I might use those for part 2. 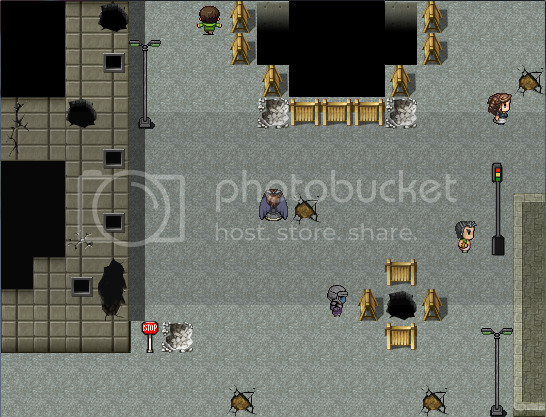 Let me know what you think if you decide to give the game a try. 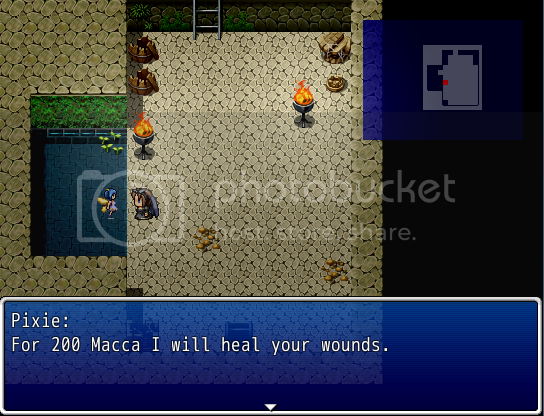 In the introduction there is a string of text-boxes that tell the backstory for the game. Obviously, this can be tough to keep interesting, but one thing I would recommend is having the image in the background change, as the topics of the Information changes. Sort of how SMT: Strange Journey (for the DS) does during its intro. Just a tip. The intro music loops annoyingly, even through the cutscene. I also don't think the music itself is very fitting for the instance its being used. The first dungeon is pretty boring, although for the most part the older SMT games are primarily dungeon crawlers, the hook to them is that you can have demon conversations. So, without being able to talk to demons or recruit them, it just feels dry. The characters themselves just feel very fake and that hurts storytelling, as in, I get bored reading what the characters are saying. I made it to the first town and decided to take a break for now, it was only around 20 minutes and it is a bit late right now. I'll possibly play a bit more later on. Along with that, the mapping is a bit clunky, especially the World Map, and the clashing face graphics aren't very appealing. I'm assuming the whole demon conversation part is an engine limitation problem, which I can understand. 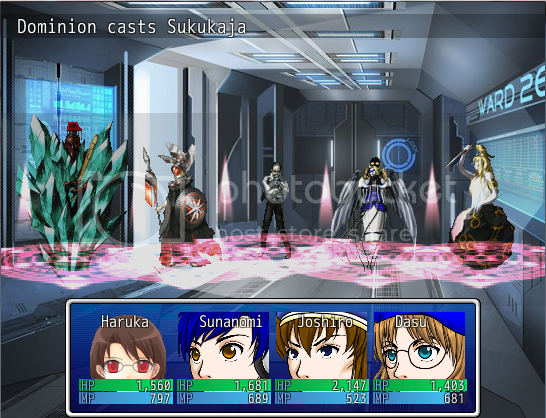 However, trying to create a Shin Megami Tensei game without demon fusion, summoning or conversations really isn't SMT. The narrative in the game is not all that great, so without these features it comes off as a fairly dry dungeon crawler. That sounds a bit harsh, especially coming from someone who only played 20 minutes of the game, but unless some drastic twist comes up soon, I don't see the game improving from my first impression. Looking back the first 3 or so dungeons are pretty weak. I just did not have time to go back and completely redo them with all the other things i had to deal with in the ace version. And yeah, engine limitations are why there are no demon conversations, and I can't see anyone making that kind of script. Like I said in a previous post, I could not find a decent face maker that made good male and female faces (getting very little feedback from the original version didn't help either). I didn't think it would be that distracting, but I guess I'm less picky about that. I'll keep the bit about the introduction in mind though. 1 Make a sequal with the new engine and try to improve what i did wrong. (or remake this one from the ground up). 2 Make a psudo sequal with the same chars in a new but similar world and setting. 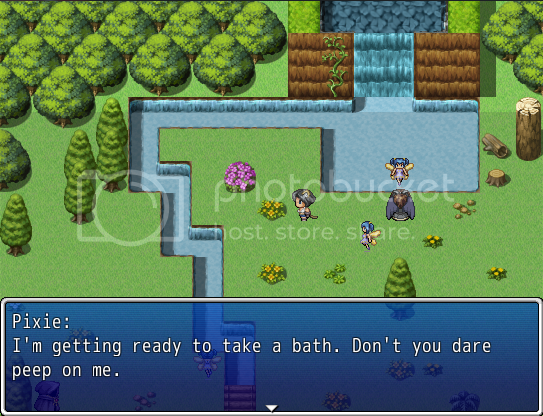 (So it won't be a fan game this way). 3 Make something entirely new. Any feedback or reccomendations would be appreciated, especially from anyone whole played my game. Thanks. 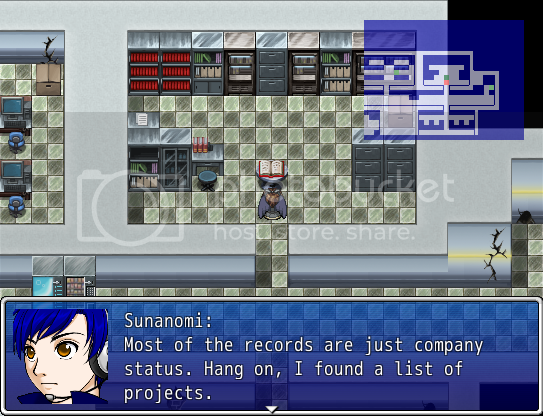 shin megami tensei on rpg maker o.o = instant download and try. dunno why some westerners dont think the persona series isnt a part of the smt series, maybe its because in the english releases the shin megami tensei isnt put beside them like the original releases of the games.